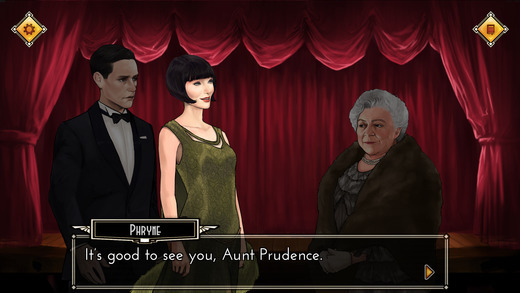 Become Phryne Fisher, the independent, feminist super-sleuth. Players will guide the heroine on a modish dance of adventure, murderous mayhem, and mystery around the world. Armed with her golden gun and with her companion, Dot Williams, in tow, the pair chase the trail of the insidious Murdoch Foyle. Can Miss Fisher and Dot decipher his clues and stay on his trail? Or will they be tricked into pursuing a false lead, causing the trail to run cold? I had never heard of either the TV show or the novels starring Miss Fisher, but that doesn’t matter. It’s easy to pick up on who’s who and their relationships to each other. The game also doesn’t get bogged down in exposition or introductions, but trusts that you’re either familiar with the characters or will catch on quickly. The bulk of the episode doesn’t revolve around Murdoch Foyle as the official description leads you to believe. He’s introduced at the beginning in a brief prologue, where he’s sentenced to death by hanging. Foyle thinks he’s the reincarnation of an Egyptian God, which makes it okay for him to run around being a serial killer. Months later, Miss Fisher and a reluctant Jack (a police officer) are attending the opera, where a horrific murder happens in the second act. 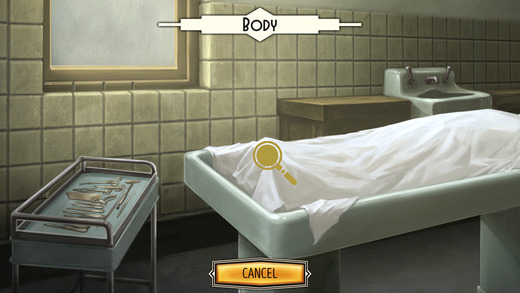 The rest of the game has you solving this murder. The women of the cast outnumber the men nine to five, which is a welcome change from the norm. Miss Fisher is a really likable protagonist – she’s clever and funny. I really loved the soundtrack of Miss Fisher. It’s set during the 1920s and the soundtrack reflects that, with happy, swinging jazz throughout. There’s also creepy violins when that wouldn’t be appropriate. There’s no voice acting beyond a few gasps from Dot, and the sound effects are good (except the slap noise that happens during a discovery can wear thin). The art is excellent overall, with detailed character models that fit in well with the painted backgrounds. There’s a nice flashback film grain effect that isn’t overdone, and sometimes there are big silent-movie style title cards, which are great. The last scene’s background is bland compared to the rest of the locations – it’s supposed to be an airstrip, but the background is only blue skies with white clouds. There are a few graphical errors, such as it being clear that a model has no legs or the characters taking a second to pop in, but these weren’t detrimental to my experience. You’re able to pick between thematic or dyslexic font in the menu, and a graphical touch that I liked was that the font will move to emphasize important points. You can turn this off if you don’t like it though. This is a short episode; it took me an hour and forty minutes to complete. This isn’t bad for the price though, and I thought it was a perfect length to get you introduced to the world of Miss Fisher. It also sets you up for future episodes without ending on too much of a cliffhanger! If you’ve played an adventure game, you’ll be right at home here. You’re able to save anywhere, and the game also autosaves for you. Miss Fisher keeps a detective journal with notes on all the people, places, and clues you encounter. Your available actions are almost always talk, examine, move, and deduce. At certain points, you have to make deductions by combining clues that you have. This was my biggest area of contention with the game. The interface for deductions would sometimes glitch out – when I dragged a clue into the boxes for combining, sometimes it would fly off screen and I would have to leave the deduction page and come back. After I realized you can also double-tap to add clues for combining, it became less frustrating. I also don’t like that you have to scroll through the whole list – in the middle of the game this can get annoying, especially if you aren’t quite sure what to combine, because you have a lot of clues. Examining your surroundings can also be a bit annoying, because you have to tap the examine option every time you want to look at something else. I thought it would be better if you could select examine, look at all the objects you want, and then cancel out of examine mode. It’s a lot of unnecessary extra tapping. 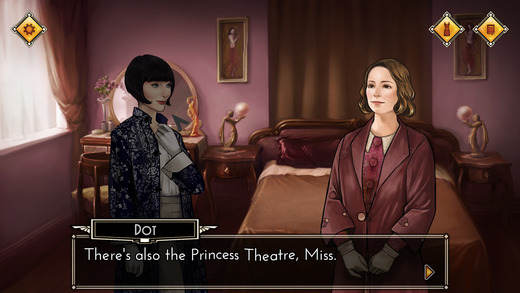 Inspecting objects will either get you a clue, a quip from Miss Fisher about how the object is irrelevant, or one of the collectible pieces of outfits scattered throughout the game’s locales. 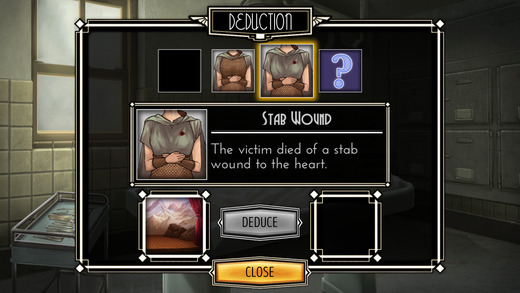 Once you collect all the pieces of an outfit, you can wear it while you’re doing your detective work. This doesn’t affect the gameplay at all, but I thought it was a nice touch to be able to customize “your” Miss Fisher. The case itself is enjoyable, if a bit linear, but it is the first episode. I find first episodes of episodic games are often the most straightforward compared to the rest, to ease the player in. I hope future episodes aren’t on the rails so much and allow you to investigate multiple threads at once. There is one instance of this, but it’s basically just a “choose where to investigate first, but it doesn’t matter” situation. Watch for a quick scene after the credits! This first episode of Miss Fisher is a promising beginning to a series of murder mystery games. I’m looking forward to more episodes, and in the meantime I might check out the novels or the TV show! You can get Miss Fisher and the Deathly Maze for $2.99 on the App Store. It’s coming soon on Android and Steam. For more on the game, check out the website, Facebook, and Twitter.